Tamago, which literally means ‘grilled egg’, (and is also called dashimaki) is essentially a Japanese omelet made by folding over the cooking egg many times, forming a series of thin layers. It is made by combining eggs, rice vinegar, and usually sugar, (sometimes soy sauce), and even sake is used in some recipes. While it is often served as nigiri sushi it can be found at most Japanese restaurants that serve sushi. Slightly sweet, with an impressively different texture due to the multiple layers, tamago is not just an unusual item in the sushi continuum, but a testament to the quality of a restaurant. Tamago is not necessarily the most popular item on the menu, however it has been traditionally significant in showing off the sushi chef’s (itamae) skills. 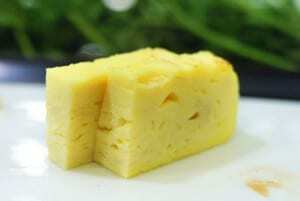 While modern tamago is usually just sliced up egg layered on top of each other, traditionally tamago was a test of one’s mettle, as it was made from one single layer, folded upon itself many times, and a broken or messy tamagoyaki was considered the mark of a poorly skilled chef. The art and presentation of a perfect tamagoyaki was a proud and honorable accomplishment, and some Japanese would even order tamago sushi prior to starting their meal to asses the sushi chef’s skills. While this is rarely the case now, the art of making tamago from one single omelet is still considered an achievement, but the simplest way is now the most common. If you are interested in trying it yourself at home, we have a tamago recipe in our recipes section, as it tamago makes a great breakfast, side, or treat any time of the day.